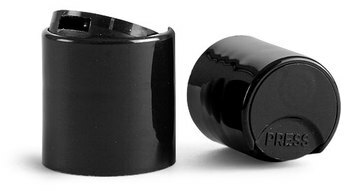 These black dispensing caps are smooth wall and come in 2 sizes to fit all of our bottles. The 20/410 and 24/410 are both disc style. Bottle Neck Sizes: 2oz and 4oz have a 20/410 neck size and the , 8oz has a 24/410 neck size.